Photo: Fox via Getty Images. Graphic: Libby McGuire. Word on the street (and around the A.V. Club offices) is that the new season of The X-Files is an improvement on the last season of The X-Files. It’s been heartening to hear, even if there was really nowhere to go but up from the show’s abbreviated 2016 revival, which included one terrific episode and five others unfortunately not written by Darin Morgan. But whatever course corrections creator Chris Carter and his team have made, however close they’ve come to approximating the supernatural-gumshoe mojo of the show’s heyday, there’s one oversight that hasn’t been addressed, one exclusion that irks this particular dyed-in-the-wool X-Files fanatic: Where is John Doggett? For those who either skipped or have subsequently repressed the unpopular, once-final run of The X-Files, Doggett was the new agent brought in at the start of the eighth (and then penultimate) season, as a way to fill the black hole that was very quickly opening at the center of the series. David Duchovny was in the middle of an ugly salary dispute with the network, making his (and Fox Mulder’s) future with The X-Files uncertain. With the star committed to appear in only a handful of episodes in season eight, Carter and company had to write around his absence, and the solution they devised was to have Mulder abducted by aliens and to provide Gillian Anderson’s Dana Scully with a new partner: a square-jawed FBI company man played by Robert Patrick, then and probably still best known for his sinister performance as the T-1000 in Terminator 2. Doggett was never a fan favorite—reaction to the character seemed to range, at least at the time, from begrudging tolerance to fiery-hot resentment. His biggest sin, of course, was simply not being Mulder: Die-hards saw a poor substitution, an attempt to replace the heart and soul of the series. But the fact that Doggett wasn’t Mulder, that the show actually wasn’t attempting to sub out their beloved star with a knockoff imposter, is part of what made him such an interesting, even invigorating addition in those two farewell seasons. And so while it makes sense that The X-Files would sweep Doggett under the rug, leaving him out of its second life (and the second movie), it’s also an unfair fate for a character who struggled from episode one to earn his place in the canon of this series—a struggle that the writers smartly baked into his arc. Doggett wasn’t just not Mulder. In many respects, he was kind of the anti-Mulder: an ex-Marine and former New York City detective, hard-boiled and no-nonsense. Whereas Mulder was idiosyncratic and individualistic, his far-out theories putting him constantly at odds with the FBI, Doggett mostly played by the book and well with others. The two characters did share some commonalities: They both possessed a certain deadpan wit (you can’t exist on a show like The X-Files, with its nonstop cavalcade of outlandish happenings, and not drop the occasional wisecrack) and traumatic backstories, Doggett haunted by the death of a son instead of the disappearance of a sister. But in worldview, and in general attitude toward the paranormal, they couldn’t be much more different. If Mulder was the true believer whose open-mindedness often cracked the case, Doggett was a skeptic, a champion of logic in the face of weekly, wild impossibility. Sound familiar? The first few episodes of season eight operate like a soft reboot, inverting the pilot’s—and the show’s—central dynamic. Suddenly, it’s Scully, lifelong rationalist, who’s forced to protect The X-Files from a close-minded interloper. Carter, who wrote the two-part season premiere, knew that viewers would, like Scully herself, instinctively dislike this new face, and he actively leaned into that. The first meeting between the two agents, in which Doggett dares to imply that maybe Scully didn’t know Mulder as well as she thought (the gall! ), ends with her throwing a cup of water in his face—a sly, intentional acknowledgement of how many fans felt about the imperative to warm to a new lead. Entrusted to head the manhunt for Mulder, Doggett is initially presented as a lackey—the bureau careerist hand-selected by the naysaying, boo-and-hiss-worthy Deputy Director Kersh (James Pickens Jr.). Carter plays on the audience’s memories of how past partner reassignments have gone, and also maybe our relationship to his new star, who had already played his fair share of heavies before securing the X-Files gig (including, again, a literal shapeshifter—the epitome of untrustworthiness). Doggett didn’t turn out to be a villain. But for the first half of the season, his relationship with Scully remained contentious, colored by distrust and even some open hostility. This did more than give The X-Files a shot in the arm; it made the show feel new again, providing even the most boilerplate of Monster Of The Week episodes (and there were a few of those in season eight—hello metal man!) with fresh dramatic tension. Truthfully, the series was running on fumes before this point, and a big reason was the beloved relationship between Mulder and Scully, which had evolved about as far as it could go—from uneasy alliance, to professional compatibility, to friendship, to something like soulmate status—without consummating their will-they/won’t-they romantic chemistry. There’s an unspoken finality to season seven of The X-Files, borne of narrative resolution (mythological loose ends were tying themselves up, and the season finale literally brings the two back to their first case), but also of a palpable sense of creative fatigue. If The X-Files was going to continue, with or without Duchovny, it was going to need some kind of wrench in the works. One borderline legitimate complaint about Doggett was that he was too similar, in his nagging doubt, to Scully. Where was the fun in a show that paired two staunch skeptics? But Scully’s resistance to buy into the supernatural mumbo jumbo happening around her was depicted as its own kind of mania, polarized from Mulder’s: a scientific demand for facts that often put her in the position of stubbornly denying the reality of what was happening in front of her. She was pathological in her dissenting opinion. Doggett was different: more of an ordinary career cop trying his damndest to roll with the punches of his strange new beat. (If you could draw a thought balloon over the character’s head at the end of every episode, it would contain some variation on “Well, I guess half-man, half-bat creatures are real.”) There was something enormously sympathetic about Doggett’s fish-out-of-water effort—his dogged attempts to get his bearings, keep pace, and move out of his comfort zone. “I’m not the agent for this case,” he insists in “Via Negativa,” but the first thing he does when getting assigned to The X-Files is read all of them over the weekend, because he’s trying to be the agent for the case. Thankfully, The X-Files didn’t attempt to replicate the sexual tension of the show’s primary partnership; Doggett and Scully develop a close but almost strictly platonic bond. 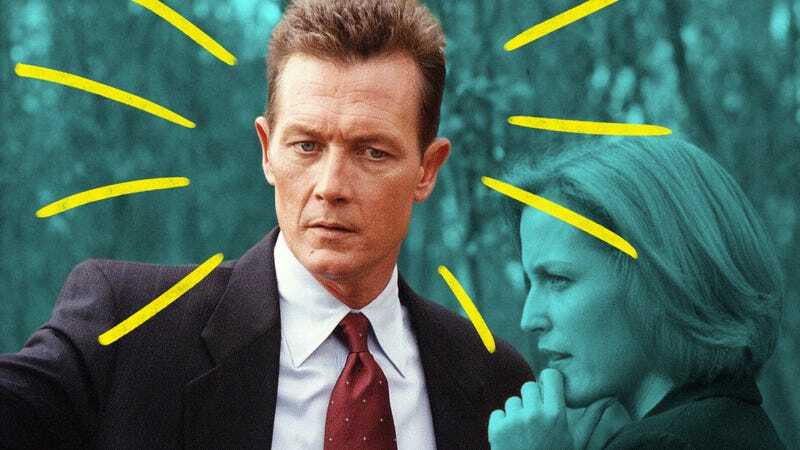 But on both the inside and outside of the series, Doggett was still treated like the new boyfriend, caught in the shadow of a very significant ex. Everyone compares him to his predecessor (“I know what Mulder would do,” Scully tells him during the manhunt. “He’d do whatever it takes.”) and that impossible standard provided the show with a sharply meta dramatic center—a self-conscious way for The X-Files to address both the absence of its star and the difficulty of selling a new one to viewers who weren’t ready to move on. But it’s Patrick, wrestling with his place in a grand mythology, that gave that conflict life, finding the relatable inferiority complex in the character’s (and show’s) dilemma. He made The X-Files’ growing pains and identity crises human. Doggett’s awareness that he’s not Mulder, and his attempts to live up to the man’s legacy regardless, gave The X-Files a new philosophical dimension, too. Suddenly, “I Want To Believe” took on new meaning, as two agents used to playing common-sense foil have to open their minds without, in Doggett’s words, closing their eyes. To that end, Doggett’s introduction gave Anderson a chance to challenge Scully’s hard-won voice of reason; without Mulder around to make the case for the impossible, she has to take the big leaps herself—and her inability to totally inhabit the mind space of her old partner provided the season with some of its most moving moments, like the ending of the underrated (and winningly disgusting) “Badlaa,” when Scully makes a tough, split-second decision only based on what she thinks Mulder would have done in that moment. Eight seasons in, The X-Files stumbled into some fresh character development for Scully, partially by giving her someone equally complicated to bounce her attitudes against. What season eight of The X-Files did was put Scully and Doggett on a journey, toward a shared trust and a new future, one that might not feature the brilliant believer looming over both their careers. Not all fans, however, wanted to go on that journey . Maybe that’s because the show itself didn’t entirely invest in it, either. For starters, it became harder to care about The Scully And Doggett Show once it became clear, through the former’s diminished screen time, that Carter was preparing for the very real possibility that Anderson might leave the show, too. The showrunners soon introduced Monica Reyes (Annabeth Gish), another FBI agent whose loopy, New Age philosophy imperfectly aligned with the role Mulder once served. Much more so than Doggett, Reyes was the “replacement Mulder”—and fans rejected her even harder than they did Doggett. What they were really rebelling against, though, was the notion that The X-Files could just relaunch itself with a new cast, like any old network cop show. The hook of the series was the aliens, werewolves, and other high-concept horror, but it was Mulder and Scully—and their sometimes comic, sometimes serious, always ambiguous rapport—that made it a phenomenon. Also, how could fans hope to let go of Mulder and fall in love with the New Class when the show seemed so reluctant to do so itself? The character’s disappearance dominates much of season eight, to the point where he becomes almost like Homer’s dream for Poochie: When he isn’t around, everyone’s always asking, “Where’s Mulder?” This was dramatically fruitful for a while, but once Duchovny did come back, only to quit the show for real at the start of season nine, the schizophrenia of The X-Files’ closing agenda became clear. Here was a show demanding that we accept a new odd couple, while continually returning to the lingering drama between the original one, who it had finally, unsatisfyingly hooked up. This have-your-cake-and-eat-it-too approach became especially apparent in the (then) series finale, which understandably thrust Mulder and Scully into the limelight, while less understandably reducing Doggett and Reyes to background players. Almost as if the previous two seasons had never happened. Whatever its other failings (and they are numerous), the one-time X-Files finale felt especially insulting to anyone who had not only accepted but also grown fond of Doggett, that New York cowboy thrust into the ghost-busting, alien-chasing business. For as much as the series betrayed the work it had done to endear him to us, he always brought an emotional honesty, even to later episodes: scrambling for a sense of self after losing his memories in Gilligan’s south-of-the-border Bourne riff “John Doe; accepting the reality-bending logic of “Scary Monsters” and then using it against the episode’s unlikely villain; making his own moving leap of faith—not just wanting to believe, but really believing—to save his partner in “Audrey Pauley.” In the (then, again) penultimate episode, Doggett tells Reyes, “I think I’m finally getting the hang of this job”—a hopeful point she concedes at the end. Maybe that was the perfect, satisfying conclusion for Doggett’s arc: the outsider found his groove in The X-Files after all. But with even Reyes returning to TV screens in this new and reportedly improved X-Files, it’s hard not to wish that Carter had found a place for the unsung hero of the show’s black-sheep years. I mean, imagine what Darin Morgan could have done with the guy!